This past Thursday evening, we had the opportunity to try one of Madison’s latest restaurants, La Kitchenette. 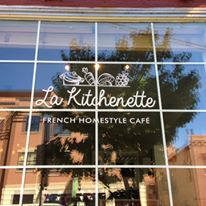 Located at 805 Williamson Street, La Kitchenette is a French cafe serving breakfast, lunch, and dinner in the former location of Chez Nanou. One of our French-speaking friends recently started working there and encouraged us to stop in soon for a meal. We were very glad we did! The menu seems small at La Kitchenette but everything they serve is nearly a meal in itself. So there is much more variety as you start to sample everything. Plus there were a number of specials when we went there. We started with an appetizer special called a Cake Provencal. If you’ve never heard of Cake Provencal, like we hadn’t, it’s a delightful little bread baked with some tasty vegetables and herbs. Ours was made with tomatoes and was an excellent choice to split among three people to start a meal. 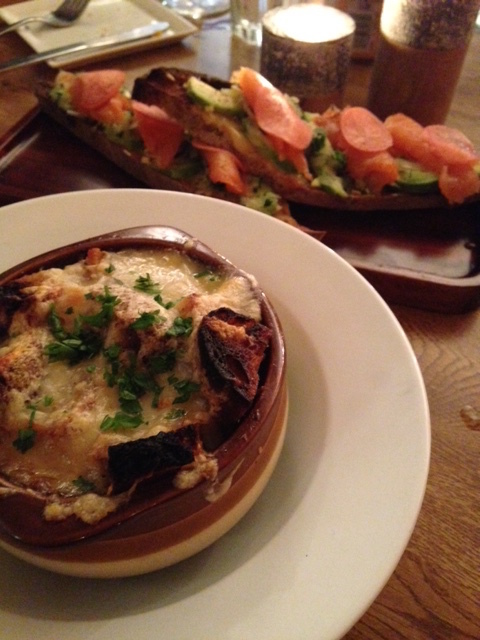 We followed the Cake Provencal by ordering the Tartine Florentine, Tartine Acidule, and the French onion soup. Of course, you’d expect really good French onion soup at a French restaurant, but the soup at La Kitchenette was out of this world. It was the perfect amount of cheese, bread, onions, and broth, and then broiled just enough to get that little crust on top. It’s one of those things you eat and keep thinking about the next time you can get there to order it again. The tartines were outstanding as well. Both were very generous portions that also came with a fresh green salad. The Tartine Florentine is served warmed and a great vegetarian option with spinach, shallots, tomatoes, sauce, and Swiss cheese. The Tartine Acidule is served cold and features smoked salmon, radish pickle, cucumber, and mayonnaise. The radish pickle was particularly tasty and an ideal complement to the salmon. For entrees, we tried the quiche entrée special, a tomato tarte entrée special, and the Poulet a la Normande. 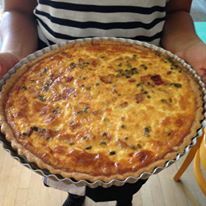 The quiche and tarte were delightful and everything you’d expect and more from a French bakery. But, the Poulet a la Normande stole the show. The dish features chicken legs cooked with cider and mustard served with persilllade potatoes and a very nice green salad. The chicken was so tender and flavorful that we savored every bite not wishing for it to end. Again, the portions on everything were generous but not over the top. We came to La Kitchenette partially to celebrate a friend’s birthday. Our server became aware of this, so we received for dessert three small, finger-sized cakes with raspberries along with enjoying the French version of singing “Happy Birthday”. A couple of appropriately-sized and delicious cappuccinos wrapped up the evening for the perfect end to our meal. Before we left, we had the opportunity to meet the owner Virginie Ok. She was charming and gracious with her French accent – someone perfectly suited to this cozy restaurant. It was like she was welcoming us into her home and sharing the joy of what she was making in her kitchen. We will definitely be back both for her hospitality as well as for all of the delicious food she offers patrons at La Kitchenette.